♦ Pre-School - Discussion on ' Gandhi Jayanti ' was done today. ♦ Pre-Primary - Introduction of blend ' st ' was done in the class. 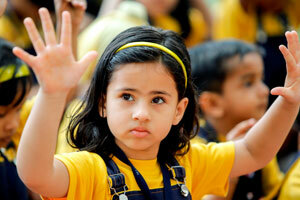 ( Pre-School &Pre-Primary ) Excellence is the gradual result of always striving to do better. The children of this age group are coming away from the safety and warmth of their homes. The foremost task for the facilitators is to help children make smooth transition from home to school. Once the comfort zone sets in for the children, they are able to master the basics of reading, writing and arithmetic. The big rocks of curriculum development in these foundational years are Language Development and Presentation Skill. This is achieved by giving a special place to English within the curriculum as it pervades all subjects. It is very important to remember that all other subjects need the skills of listening, speaking, reading, writing and good presentation for 'effective' learning to happen. Therefore, our curriculum provides for a variety of experiences through story-telling, role play, group activities, art, music, field excursions, sports activities etc. A complete phonics program is introduced in these classes so that children learn the language by getting familiar with the rules governing it. This program takes care of all kinds of learners---be it kinesthetic, visual or auditory so that all the students benefit from it.